The Avaspot outdoor solar lights set themselves apart from the rest in a very interesting way. Right now, they hold a 4.3 star rating on Amazon. Let's take a look in more detail. The first thing that makes the Avaspot outdoor solar lights unique is the shape and size. Unlike other outdoor wall mounted lights that have a slanted outward design, these have a downward facing light with the solar panel on the top. Much like a lamp. That being said, these will be slightly bigger than some of the others we have reviewed. It size sits at 150 x 120 x 38 mm. Still not as big as it could be, but it is definitely not inconspicuous. Another thing that sets these lights apart from the herd are the 30 LEDs that are included. However, this is where it starts to get a little confusing. Under the quoted LED power, it states 30 LEDs, 22-24 lumens/PCS, 0.2W. When looking at the quoted brightness, it says 120 lm. If they are trying to say that the total brightness is 120 lumens, but each LED puts out 22-24 lumens, that is a bit impossible. If each LED put out 22-24 lumens, the total output would be between 660 and 720. So something is off there. If it really is a total output of 120 lumens, that is surprisingly low, especially for 30 LEDs included. But if its somewhere closer to 720, that is awesome. Nevertheless, users are happy with the brightness, so it seems like there is no real problem. Besides that, the lights also feature a 18650 rechargeable 3.7w battery with a capacity of 1200mAh. For this many lights and depending on the total output, that battery may struggle to keep them on throughout the night. Even some other lights with only 4 LEDs include a 2200mAh battery. However, 1200mAh is still a decent capacity and should be able to keep them powered throughout the night. When it comes to the solar panel, there is not a lot of information given about the type or conversion rate. However, it does state that the panels are 1.3 watts and have a max voltage of 5.5. This is pretty regular when looking at other outdoor solar lights. Past that, there is not a lot of information to go on. The body is made from plastic, like many we have seen thus far. It is completely weatherproof, with a waterproof rating of IP64. Again, very basic for most outdoor lights, but nevertheless great. Since they do feature the top down lighting method, any water will flow right off of the side of the fixture. Overall, there is no need to worry about these in any type of weather. The one feature of these lights is that they are purely motion sensor activated. There is no other setting for dim lights, or always on lights. The only time these lights will come on is when there is motion detected. Once the PIP motion sensor picks up movement, the lights will come on, and they will remain on for 10 seconds after motion is last sensed. The sensor has the standard 120 degree sensing angle, but it also features a longer sensing distance between 10 and 26 feet. 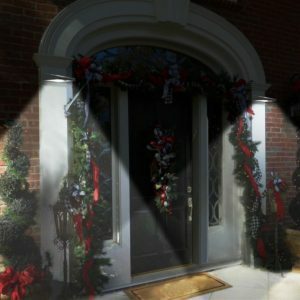 So these lights will most likely come on before you are anywhere near the actual location, which is a nice way of scaring off intruders or critters. Unfortunately there was very little information to go from. The seller of this particular outdoor light is a third party, not the manufacturer. However, Avaspot seems to deal in various home accessories. These include oil diffusers, solar lights, indoor lighting, kitchen appliances, and other various electronics. All of their products have between 4 and 5 stars, so you know that they are being well received by consumers. The Avaspot outdoor solar lights feature 30 LEDs, which is far more than many we have reviewed. Depending on the true Lumen output these could be very bright. The unique design not only sets it apart from the bulk of outdoor solar lights, it also makes for a larger solar panel. The once included here has a max wattage of 1.3 and a max voltage of 5.5, which is pretty nice. However, no info was given for the actual conversion rate. But most outdoor solar lights have somewhere between 17%. Even though it is slightly bigger, due to the special design, it is still small enough for a wall mount. Plus, it is not very heavy so no issues there. It is totally weather proof with a waterproof rating of IP64. Plus due to the design, water just kind of rolls off the top. The panel is totally waterproof so no need to worry about water slipping through the cracks and messing up your light. The motion sensor is very good. It has the standard 120 degree field of view, but can detect motion at a range of 10 to 26 feet. Most have a standard of 3 meters, which is 10 feet. But this one goes above and beyond that to 26 feet. There is a lot of information missing on the Amazon page. Nothing against the actual product, but more so against the seller. Some information is missing regarding the solar panel. And some information is just plain confusing, especially regarding the total lumen output of the LEDs. The battery is sufficient, but for the amount of lights and the supposed lumen output, would be nice to see a larger battery. This one is just 1200mAh, while even smaller lights include a 2200mAh battery. There is only one mode for this light and that is the motion sensor. There is no setting for a dim light or to have the light always on. While it does the motion sensor very well, would be nice to see multiple settings. The range alone is a awesome reason to buy these lights. the fact that it can detect your motion from 26 feet is just incredible. Past that, they are supposedly very bright, weatherproof, and reliable when it comes to the solar panel charging the battery. There should be no problem using them throughout the night. Also given that they only come on when motion is sensed, the smaller battery makes no difference. However, there is no setting to have them always on, so you kind of miss out on that. Overall, the Avaspot outdoor solar lights are a pretty good buy. Even though they only have one lighting setting, they do their job very well. However the missing information might confuse some people. But if you feel confident assuming they use the same tech as others on the market, it may not be a problem for you. Right now, you can find them on Amazon for $19.59. What's more is that you get two with each purchase. For more information about the other best outdoor solar lights, check out the rest of Green and Growing. Here are some top questions that I found for people seriously considering buying the Avaspot Outdoor Solar Lights. Will these function in cold weather? Yes, they will function just fine. How large of an area do these light up? Estimated about 3-4 square feet. Will these stay on longer than 10 seconds if there is continuous motion? Yes, the 10 second timer starts after the last motion is sensed.